You may be saying to yourself, “Surely not. The kitchen counter or the toilet is way grosser than my computer.” The fact is, you likely clean your counter top after you spill food on it, and you probably give your toilet a good scrubbin’ before you have company over, meanwhile, your PC is sitting on your desk attracting new bacteria like some kind of germ magnet. Scientist with cotton swabs have researched this and discovered that your computer mouse and keyboard has three times more germs than your toilet seat. Do you eat food at your computer? If you do, then your keyboard has even more germs. 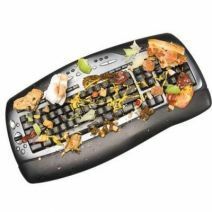 All of those crumbs that fall inside of your keyboard don’t magically disappear; rather, food crumbs are organic material that decomposes with the help of microscopic bugs. The way these small bugs break down food is by laying eggs in the crumbs. The eggs then hatch and the larva feeds on the crumbs. Therefore, you may be typing every day on a parasitic breeding ground. By now, you may want to take a flamethrower and incinerate your PC. Yes, that would effectively take care of your germ problem, but you can achieve the same goal with disinfectant wipes and a can of compressed air (and renting a flamethrower can be expensive). Before you wipe down your keyboard, flip it over and give it a good shake. Every crumb that falls out on your desk may represent a memorable lunch, but this is not the time to get sentimental, you are on a mission to clean! After you have wiped down your keyboard and mouse and dislodged the extra crumbs with your compressed air can, it is now time to clean out another germ hotbed, the PC unit. With a screwdriver you will be able to open the case, and if this is the first time that you have peered into the belly of your machine, then you are in for a surprise. You will see dust everywhere, and this is not your regular garden-variety dust that we are talking about; this is electronically charged dust bunnies. Held together with static electricity, these computer dust bunnies are pretty gross in their own right. Like their keyboard counterparts, dust bunnies are also filled with living organisms like dust mites and other parasites. Take a microscope to the film of dust and you will make more fun scientific discoveries like hair, lint, spider webs, dead skin, and even light rubbish and debris. You can remedy this dust infestation with a paper towel and your trusty can of compressed air. Be sure to use the paper towel first to wipe away the big chunks so that you are not filling the room with dust and then breathing in all of those fun ingredients that we listed off. Be careful not to hit the fans directly with compressed air so as to not cause overspin. With your computer cleaned, your fans will no longer be clogged with dust, which means it will run better and not be at risk from overheating. While you are in cleaning mode, go ahead and grab some glass cleaner and wipe down your monitors. Now that you are informed on the seriousness of how disgusting computers really are, you will want to include cleaning your PC on your regular chore list. Manual cleaning of a workstation is one IT service that unfortunately cannot be automated and remotely managed by us. Although, Tektonic does make it a habit to clean out every PC that we physically work on so that we are not handing off to our clients hotbeds of germs. A dirty computer is gross, but with a little elbow grease it can be made clean enough to eat off of. Although, we would not recommend it, because that is probably what caused the germ problem in the first place.